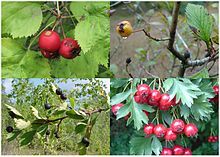 Crataegus (/krəˈtiːɡəs/), commonly called hawthorn, quickthorn, thornapple, May-tree, whitethorn, or hawberry, is a genus of several hundred species of shrubs and trees in the family Rosaceae, native to temperate regions of the Northern Hemisphere in Europe, Asia and North America. The name "hawthorn" was originally applied to the species native to northern Europe, especially the common hawthorn C. monogyna, and the unmodified name is often so used in Britain and Ireland. The name is now also applied to the entire genus and to the related Asian genus Rhaphiolepis. The generic epithet, Crataegus, is derived from the Greek kratos "strength" because of the great strength of the wood and akis "sharp", referring to the thorns of some species. The name haw, originally an Old English term for hedge (from the Anglo-Saxon term haguthorn, "a fence with thorns"), also applies to the fruit. 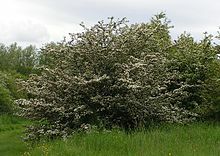 Crataegus species are shrubs or small trees, mostly growing to 5–15 m (16–49 ft) tall, with small pome fruit and (usually) thorny branches. 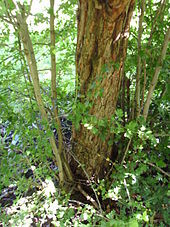 The most common type of bark is smooth grey in young individuals, developing shallow longitudinal fissures with narrow ridges in older trees. The thorns are small sharp-tipped branches that arise either from other branches or from the trunk, and are typically 1–3 cm long (recorded as up to 11.5 cm (4.5 in) in one case). The leaves grow spirally arranged on long shoots, and in clusters on spur shoots on the branches or twigs. The leaves of most species have lobed or serrated margins and are somewhat variable in shape. The fruit, sometimes known as a "haw", is berry-like but structurally a pome containing from one to five pyrenes that resemble the "stones" of plums, peaches, etc., which are drupaceous fruit in the same subfamily. The "haws" or fruits of the common hawthorn, C. monogyna, are edible, but the flavor has been compared to over-ripe apples. In the United Kingdom, they are sometimes used to make a jelly or homemade wine. The leaves are edible, and if picked in spring when still young, are tender enough to be used in salads. The young leaves and flower buds, which are also edible, are known as "bread and cheese" in rural England. In the southern United States, fruits of three native species are collectively known as mayhaws and are made into jellies which are considered a delicacy. The Kutenai people of northwestern North America used red and black hawthorn fruit for food. On Manitoulin Island, Ontario, some red-fruited species are called hawberries. During the pioneer days, white settlers ate these fruits during the winter as the only remaining food supply. People born on the island are now called "haweaters". The fruits of the species Crataegus pinnatifida (Chinese hawthorn) are tart, bright red, and resemble small crabapple fruits. They are used to make many kinds of Chinese snacks, including haw flakes and tanghulu. The fruits, which are called 山楂 shān zhā in Chinese, are also used to produce jams, jellies, juices, alcoholic beverages, and other drinks; these could in turn be used in other dishes (for instance, many older recipes for Cantonese sweet and sour sauce call for shānzhā jam). In South Korea, a liquor called sansachun is made from the fruits. In Iran, the fruits of Crataegus (including Crataegus azarolus var. aronia, as well as other species) are known as zâlzâlak and eaten raw as a snack, or made into a jam known by the same name. A 2008 Cochrane Collaboration meta-analysis of previous studies concluded that evidence exists of "a significant benefit in symptom control and physiologic outcomes" for an extract of hawthorn used as an adjuvant in treating chronic heart failure. A 2010 review concluded that "Crataegus [hawthorn] preparations hold significant potential as a useful remedy in the treatment of cardiovascular disease". The review indicated the need for further study of the best dosages and concluded that although "many different theoretical interactions between Crataegus and orthodox medications have been postulated ... none have [yet] been substantiated. Overdose can cause cardiac arrhythmia and low blood pressure, while milder side effects include nausea and dizziness. Patients taking digoxin should avoid taking hawthorn. Hawthorn rootstock on a medlar tree in Totnes, United Kingdom. The wood of some Crataegus species is hard and resistant to rot. In rural North America, it was prized for use as tool handles and fence posts. First Nations people of western Canada used the thorns for durable fish hooks and minor skin surgeries. 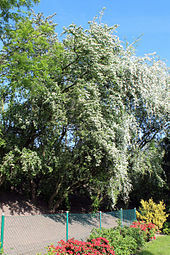 The Scots saying "Ne'er cast a cloot til Mey's oot" conveys a warning not to shed any cloots (clothes) before the summer has fully arrived and the Mayflowers (hawthorn blossoms) are in full bloom. Hawthorn trees demarcate a garden plot. According to legend, they are strongly associated with the fairies. In Celtic lore, the hawthorn plant was used commonly for inscriptions along with yew and apple. It was once said to heal the broken heart. In Ireland, the red fruit is, or was, called the Johnny MacGorey or Magory. ^ J. B. Phipps (1997). Monograph of northern Mexican Crataegus (Rosaceae, subfam. Maloideae). Sida, Botanical Miscellany. 15. Botanical Research Institute of Texas. p. 12. ISBN 9781889878294. ^ Voss, E. G. 1985. Michigan Flora: A guide to the identification and occurrence of the native and naturalized seed-plants of the state. Part II: Dicots (Saururaceae–Cornaceae). Cranbrook Institute of Science and University of Michigan Herbarium, Ann Arbor, Michigan. ^ a b c Graves, Robert. The White Goddess: A Historical Grammar of Poetic Myth, 1948, amended and enlarged 1966, New York: Farrar, Straus and Giroux. ^ a b "Crataegus species - The hawthorns". Plants For A Future. 2012. Retrieved 12 April 2019. ^ a b c d "Black hawthorn (Crataegus douglasii)". Ministry of Forests, Lands, Natural Resource Operations and Rural Development, Government of British Columbia. 2019. Retrieved 12 April 2019. ^ a b c d e f g Phipps, J.B., O'Kennon, R.J., Lance, R.W. (2003). Hawthorns and medlars. Royal Horticultural Society, Cambridge, U.K.
^ Richard Mabey, Food for Free, Collins, October 2001. ^ Pittler MH, Guo R, Ernst E (23 January 2008). Guo R (ed.). "Hawthorn extract for treating chronic heart failure". Cochrane Database of Systematic Reviews: CD005312. doi:10.1002/14651858.CD005312.pub2. PMID 18254076. ^ a b Tassell M, Kingston R, Gilroy D, Lehane M, Furey A (2010). 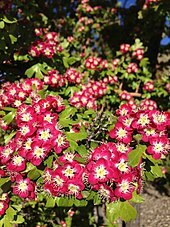 "Hawthorn (Crataegus spp.) in the treatment of cardiovascular disease". Pharmacognosy Reviews. 4 (7): 32–41. ^ "A Modern Herbal – Hawthorn". botanical.com. Retrieved 12 September 2015. ^ "FirstVoices- Ktunaxa. Plants: medicine plants: words". Retrieved 11 July 2012. ^ "Hawthorn". Memorial Sloan Kettering Cancer Center. 2019. Retrieved 12 April 2019. ^ Dasgupta A, Kidd L, Poindexter BJ, Bick RJ (August 2010). "Interference of hawthorn on serum digoxin measurements by immunoassays and pharmacodynamic interaction with digoxin". Arch Pathol Lab Med. 134 (8): 1188–92. doi:10.1043/2009-0404-OA.1. PMID 20670141. ^ Tankenow Roberta; Tamer Helen R.; Streetman Daniel S.; Smith Scott G.; Welton Janice L.; Annesley Thomas; Aaronson Keith D.; Bleske Barry E. (2003). "Interaction Study between Digoxin and a Preparation of Hawthorn (Crataegus oxyacantha)" (PDF). J Clin Pharmacol. 43: 637–642. doi:10.1177/0091270003253417. ^ "Hawthorn (Crataegus monogyna) progression". Bonsai Empire. 2014. Retrieved 2 October 2014. ^ "Scuil Wab: Wird O The Month – Mey". Scottish Language Dictionaries. 2003. Archived from the original on 4 June 2008. Retrieved 28 May 2008. ^ "Ne'er cast a clout till May be out". The Phrase Finder. Retrieved 28 May 2008. ^ "Hawthorn". Encyclopædia Britannica (11th ed.). 1911. pp. 101–102. ^ "Hawthorn - Reddish Vale Country Park". www.reddishvalecountrypark.com. Retrieved 13 December 2017. ^ Monaghan, Patricia (11 March 2004). The Red-Haired Girl from the Bog: The Landscape of Celtic Myth and Spirit. New World Library. p. 67. ISBN 978-1-57731-458-5. ^ "Language of Flowers - Flower Meanings, Flower Sentiments". www.languageofflowers.com. Retrieved 26 November 2016. ^ a b "Section 10-030 State floral emblem". mo.gov. Retrieved 12 September 2015. ^ "Sarah Lucille Turner". womenscouncil.org. Retrieved 12 September 2015. ^ a b Bailey, L.H. ; Bailey, E.Z. ; the staff of the Liberty Hyde Bailey Hortorium. 1976. Hortus third: A concise dictionary of plants cultivated in the United States and Canada. Macmillan, New York. ^ Palmer E.J. (1925). "Synopsis of North American Crataegi". Journal of the Arnold Arboretum. 6 (1–2): 5–128. ^ "Missouri State Flower". 50states.com. Retrieved 12 September 2015. Wikimedia Commons has media related to Crataegus. Wikisource has the text of a 1911 Encyclopædia Britannica article about Hawthorn.